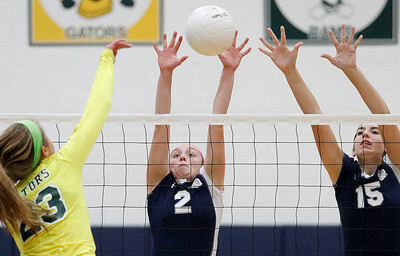 Matthew Apgar - mapgar@shawmedia.com Jordan Proszenyak of Crystal Lake South, left, hits the ball over the net as Cary-Grove's Erin Olson, center, and Ally Splitt, right, defend for the Trojans during their girls volleyball match on Tuesday, Oct. 06, 2015 at Cary-Grove High School in Cary. The Trojans of Cary-Grove won 25-14, 25-14. 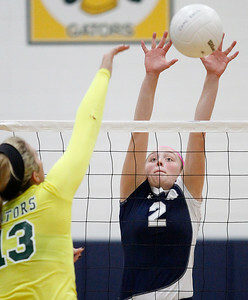 Matthew Apgar - mapgar@shawmedia.com Cary-Grove's Erin Olson, right, hits the ball up as Crystal Lake South's Jordan Proszenyak defends during their girls volleyball match on Tuesday, Oct. 06, 2015 at Cary-Grove High School in Cary. The Trojans of Cary-Grove won 25-14, 25-14. 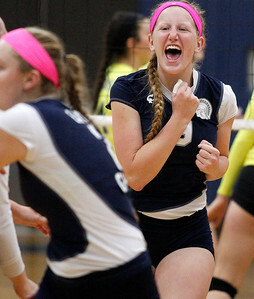 Matthew Apgar - mapgar@shawmedia.com Cary-Grove's Maddie Katchen celebrates a point against Crystal Lake South during their girls volleyball match on Tuesday, Oct. 06, 2015 at Cary-Grove High School in Cary. The Trojans of Cary-Grove won 25-14, 25-14. Matthew Apgar - mapgar@shawmedia.com Hannah Koenig, left, and Jordan Proszenyak of Crystal Lake South await the ball from Ally Splitt, front left, and Erin Olson of Cary-Grove during their girls volleyball match on Tuesday, Oct. 06, 2015 at Cary-Grove High School in Cary. The Trojans of Cary-Grove won 25-14, 25-14. 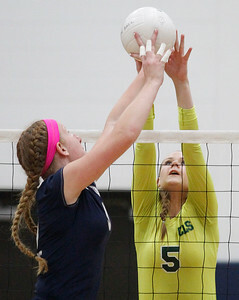 Matthew Apgar - mapgar@shawmedia.com Cary-Grove's Maddie Katchen hits the ball into the waiting hands of Kleja Cerniauskaite of Crystal Lake South during their girls volleyball match on Tuesday, Oct. 06, 2015 at Cary-Grove High School in Cary. The Trojans of Cary-Grove won 25-14, 25-14. 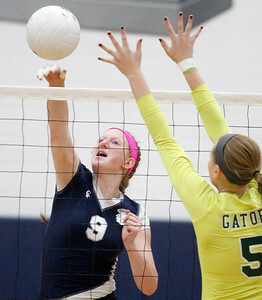 Matthew Apgar - mapgar@shawmedia.com Cary-Grove's Maddie Katchen, left, hits the ball over past Jordan Proszenyak of Crystal Lake South during their girls volleyball match on Tuesday, Oct. 06, 2015 at Cary-Grove High School in Cary. The Trojans of Cary-Grove won 25-14, 25-14. 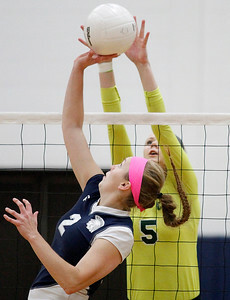 Matthew Apgar - mapgar@shawmedia.com Cary-Grove's Maddie Katchen hits the ball around the defending hands of Kleja Cerniauskaite of Crystal Lake South during their girls volleyball match on Tuesday, Oct. 06, 2015 at Cary-Grove High School in Cary. The Trojans of Cary-Grove won 25-14, 25-14. 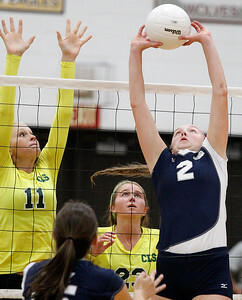 Matthew Apgar - mapgar@shawmedia.com Cary-Grove's Erin Olson hits the ball over the net as Kleja Cerniauskaite of Crystal Lake South defends during their girls volleyball match on Tuesday, Oct. 06, 2015 at Cary-Grove High School in Cary. The Trojans of Cary-Grove won 25-14, 25-14. 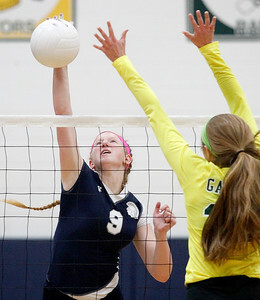 Matthew Apgar - mapgar@shawmedia.com Jordan Proszenyak of Crystal Lake South, left, hits the ball over the net as Cary-Grove's Erin Olson defends for the Trojans during their girls volleyball match on Tuesday, Oct. 06, 2015 at Cary-Grove High School in Cary. The Trojans of Cary-Grove won 25-14, 25-14. 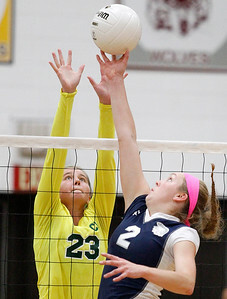 Cary-Grove's Maddie Katchen hits the ball around the defending hands of Kleja Cerniauskaite of Crystal Lake South during their girls volleyball match on Tuesday, Oct. 06, 2015 at Cary-Grove High School in Cary. 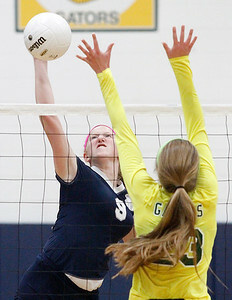 The Trojans of Cary-Grove won 25-14, 25-14.